A Muslim settlement is awaiting the result of research that may confirm its Jewish ancestry. Agniva Banerjee reports from Malihabad on the wait of the Pathans. About an hour's drive from Lucknow is Malihabad, an affluent farming settlement of ancient Muslim households and sprawling mango orchards where there is a calm reassurance that life is leisure. Here, in a palace called Bada Mahal, the same place where the character played by Shashi Kapoor tried to win over a lovely Englishwoman played by Nafisa Ali in Junoon, another Pathan is going through a conflict of emotions. This time, it's not a matter of the heart. 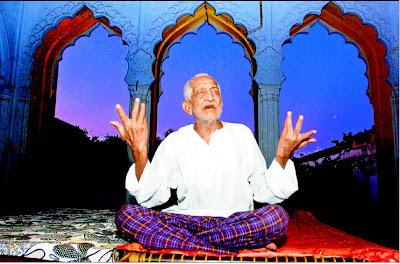 Sitting cross-legged on a charpoy under the grand canopy of Bada Mahal, Qavi Kamaal Khan, the 92-year-old patriarch of the house, ruminates over the identity of his Afridi tribesmen, originally warriors from Afghanistan who over the last millennium settled in a dozen locations in UP and the rest of India. Liberal by political temperament but pious by Islamic persuasion, Khan is bracing himself to face the result of his 28-year-old nephew's research into the clan's ancestry. The nephew, Navras Jaat Aafreedi, is part of an international project to trace the Ten Lost Tribes of Israel. It takes some courage to tell a Muslim warrior community that it was once Jewish. Aafreedi took the chance, inspired by ancient literary references and common Semitic customs that link the Afridis to one of the Lost Tribes. To prove the premise conclusively, DNA samples of Afridi men were collected at Malihabad five years ago. Kamaal Khan knows that the result of the DNA analysis may be out any time. He doesn't want to live to hear that he is descended from a Jew. "Yahudiyon ki qaum ek bahut badnaam qaum hai," Khan says in chaste Urdu. "It hurts me when I think that my forefathers were from Israel." In contrast to his uncle, Aafreedi, a man with a modern outlook, is not ashamed of his possible Jewish ancestry. In some ways, The Sunday Times of India is responsible for Khan's distress. Five years ago, this paper carried an exclusive piece by its London correspondent on how genetic studies had proved the Semitic origin of the Marathi-speaking Bene Israel community mainly based in Mumbai, Thane, Pune and Ahmedabad. The piece mentioned that the research was led by Tudor Parfitt, professor of modern Jewish studies at London's School of Oriental and African Studies. Aafreedi, then a post-graduate student at Lucknow University and now on a scholarship at Tel Aviv University, read the report and knew what he had to do. He invited Parfitt on a joint expedition to Malihabad. Parfitt, who has traced lost Israeli tribes all over the world, was conducting his own research into the tribe of Ephraim, from whom the Afridis have purportedly descended. Since there was no way of collecting a large DNA sample data from the Afridis of war-torn Afghanistan, Parfitt seized the opportunity and arrived in Malihabad on November 14, 2002, and collected DNA samples of the Afridis there. The analysis is still being done by two scientists at University College, London. The Pathans came to Malihabad in 1202 with the invader Muhammad Bakhtiar Khalji, one of the generals of Qutb-ud-din Aibak and founder of the Khalji dynasty. But it was in 1761 that the greatest wave of Afridi migrants arrived with the invader Ahmad Shah Abdali, who fought the Marathas in the Third Battle of Panipat. In Malihabad's vast mango groves, the Afridis and all the other Pathan tribes, such as the Yusufzais, Bangashs and Ghilzais, have long given up their martial ways in favour of pastoral pleasures. They have also forgotten Pushto. They now speak Hindi and Urdu, and have produced some of India's greatest Urdu poets. They have become a business community specialising in the mango trade and the Mughal art of zardozi, the embellishment of silk with gold. Today, the settlement is replete with handsome, fair-complexioned men and very pretty, petite women. The Pathans of Malihabad are extremely proud of their fine, chiselled features and skin colour, traits that easily distinguish them from other communities (they usually make their pride evident off-the-record). That's one reason why they seldom marry outside the community, maintaining the genetic information of the people of the Khyber Agency intact. Very valuable to the sleuths of genetics. Despite the historical taming of these Pathans, mention the word Jew and the ancient warrior instinct of the Afridis comes alive. "I would advise you not to go around asking the men here what they feel about the research," Khalid Iftikhar, a mango planter and a man known among the locals for his good nature, warned this correspondent. "Ever since Parfitt took the DNA samples, there has been increasing displeasure among the Afridis over the purpose of the research." Collecting the DNA samples in November 2002 was a taxing exercise and took great discretion. It was the month of Ramzaan, and Aafreedi and Parfitt took great pains convincing the men that their fast was in no way broken by their act of collecting mouth swabs. "No particle is getting inside your system. Rather, we are just extracting particles from the inside of your cheek," Aafreedi kept saying before Parfitt could take a mouth swab. The exercise almost came to a halt when an Afridi family realised that the swabs were taken to prove their Jewish ancestry. Over the years, all the Pathans here have come to know of the ongoing research. It is such a sensitive issue that only the virtue of being a direct relation of Qavi Kamaal Khan has kept Aafreedi from coming in harm's way. "I am worried about Navras' safety. The issue (of the research) is also getting hotter. One day in March, I got a call from a man in Israel. 'Hello my long lost brother' he told me on the phone. He said he would come down to India soon to meet his 'Jewish brothers' in Malihabad. Of course, I welcomed him. But he hasn't shown up yet," says Iftikhar. The purported Jewish origins of the Afridis is well documented in medieval texts. "The tribe was driven into exile and eventually into oblivion by the Assyrians in 721 BC. Great Jewish writers like the 10th century Saadia Ga'on and the 11th century Moses ibn Ezra mention Afghanistan and the Pathan territories in Pakistan as the home of Jews descending from the Lost Tribes," Aafreedi says. "And the second President of Israel, Itzhak Ben-Zvi, a Lost Tribes enthusiast, wrote in great detail about the Israelite descent of the Afridi Pathans in his book The Exiled and the Redeemed in 1957." Critics of the DNA project see in it a grand Zionist agenda to declare a few Third World populations as Jewish and bring them over to Israel to swell a cheap labour pool or to put them at the frontlines of the ongoing conflict with the Palestinians. But Parfitt and Aafreedi see a grand humanist purpose in the research. "Genetics for the first time is giving us incontrovertible evidence that racism is false. The modern world since the Second World War has been at great pains to put different cultures on an equal footing. But the idea that the differences between people should not divide humanity but be a cause to celebrate has mostly gone unappreciated. Post-World War, the modern world concentrates on similarities. Biology and genetics are showing us that we are identical," Parfitt told this correspondent in an earlier interview. It is this that bothers the Pathans of Malihabad and Qavi Kamaal Khan, once a freedom fighter, the most.